This CD comprises two 30 minute brainwave entrainment tracks. The pulse frequency for both tracks is 10 Hz (alpha). The pulse is generated by isochronic, monaural, and binaural waveforms. The two tracks differ only in terms of the ambient nature sounds and harmonic melodies accompanying each track. Track 1 Water Chimes includes the soothing sound of flowing water and bamboo wind chimes. Track 2 Birdsong Shower includes the relaxing sound of gentle rain with distant bird songs. Alpha brainwave frequencies are associated with mind states of deep calmness, relaxation, and inner well-being. 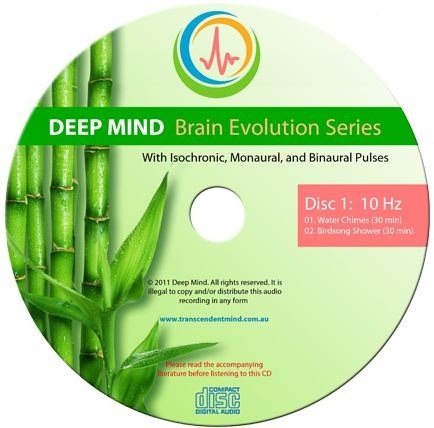 The brainwave entrainment pulses on this CD are effective when listened to through audio speakers or headphones. Use passive noise-isolating in-ear headphones for optimal audio reproduction of entrainment pulses. Quality pillow speakers may be used. (Be careful using chorded headphones when sleeping.) Do not set your audio player to repeat the track.